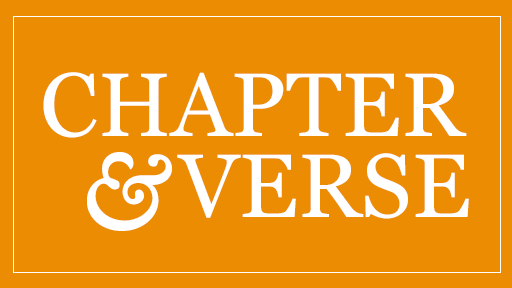 KATE OLSON, correspondent: Since its founding by the Methodist Church in 1836, Emory University has had a commitment to “educate the heart as well as the mind.” This is just what educational institutions need to be doing, echoes a visiting professor—His Holiness the Dalai Lama. HIS HOLINESS THE DALAI LAMA (speaking at podium): You made me an honorary professor of this university. But I always describe hopeless professor. Mainly I’m a very lazy person. I never do homework. OLSON: But the Dalai Lama has a serious message: how to address the urgent problems in society and the moral crisis he says the world is facing. 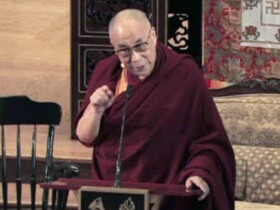 DALAI LAMA (at podium): The society lacks a real conviction to moral principles, the ultimate source of inner strength. So how to bring the real conviction, those basic values that are basis of happy life? OLSON: Wendy Farley is a professor of religion and ethics at Emory. PROFESSOR WENDY FARLEY (Department of Religion, Emory University): We’re in extremely desperate times, and in terms of global warming, in terms of warfare, in terms of the increased gap between rich and poor in our country and around the world—I myself have thought, where do you get a lever for change? OLSON: To solve these universal problems, the Dalai Lama says, people must face them together. To do so he promotes what he calls secular ethics, a system of ethics that draws on basic human values and can appeal to everyone, religious and nonreligious alike. At the heart of this approach is the cultivation of genuine compassion. 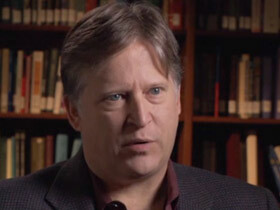 Paul Root Wolpe directs the Center for Ethics at Emory. PROFESSOR PAUL ROOT WOLPE: (Professor of Bioethics and Director, Center for Ethics at Emory University): The Dalai Lama’s compassion-based ethic says if you meditate on compassion, and you make yourself a compassionate person, when the ethical issues arise you will have the correct personal approach to it. OLSON: Because religions often divide us, the Dalai Lama says, he turns to education to teach secular ethics. DALAI LAMA (at podium): Religion, no matter how wonderful, it cannot be universally accepted. GESHE LOBSANG TENZIN (in secular ethics classroom): Can we find a way to relate to them from our heart? OLSON: Developing what the Dalai Lama calls “warm-heartedness” is part of a for-credit class called “Secular Ethics 101.” Geshe Lobsang Tenzin, a former Tibetan monk, teaches the class. LOBSANG: In proposing secular ethics, His Holiness is not proposing something irreligious form of practice, but rather something that all religions have a lot to say, a lot to contribute to and guide us, but also something that we as human beings have in our biology, whether we follow one religion or not, and those kind of universal or the basic human values that perhaps we have developed before we even had religions. OLSON: Lobsang guides a meditation on compassion which begins with recognizing the fundamental longings he says everyone shares. LOBSANG: To be able to recognize at that deeper level how we are all in the same boat. We have the same goals and aspiration, deep aspiration to be happy, free of suffering, if we can relate to others from that common aspiration we share. OLSON: The other key to compassion, Lobsang says, is developing awareness of the interdependence of all life. LOBSANG: That kind of awareness helps us develop gratitude towards others, and the gratitude is what leads to a certain sense of endearment towards others, and when we feel affection towards someone it’s very hard to harm them. 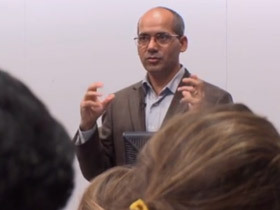 OLSON: To develop his curriculum, Lobsang drew from a thousand-year-old Tibetan Buddhist practice called Lojong, which is designed to transform negative states of mind, such as anger and suspicion, to positive emotions such as empathy. FEMALE STUDENT: I feel I have started to develop that space we talked about, between the stimulus and the reaction, so rather than just saying something nasty back to them and regretting it later, I kind of have developed an ability to pause and think about our interconnectedness. OLSON: While the Dalai Lama offers insight and training in compassion, Professor Root Wolpe says he does not present a way for thinking through complex ethical issues. WOLPE: The ethical issues that engage us are the ones where it isn’t clear what the right answer is, where we have different ethical needs competing with each other, where both answers express compassion in some way. So it isn’t compassion or not compassion. It’s which one is the right compassion, and for that we need the discerning mind. What the Dalai Lama does not do is give us any help in the discerning part. OLSON: Bringing together the insights from science and spirituality is paramount to the Dalai Lama’ s vision of a more compassionate world, as reflected in the crimson robes of the Tibetan monks who are part of an exchange program. LOBSANG: We are at a very important time, really, where science and the wisdom traditions are both finding a way to have a conversation and collaborate in understanding our human condition. OLSON: Wendy Farley says the dialogue on secular ethics is reminding everyone of who we really are. FARLEY: We’re people who are connected to one another. We’re people who can care and be compassionate and delight in one another. That’s who we are. If we can remember that, we will act differently in the world. We would hopefully act differently about poverty, we would act differently about climate change, we would care about the suffering we’re producing. We would have the courage of heart to face these things. OLSON: And action is what the Dalai Lama stresses. DALAI LAMA: So human intelligence and human potential of warm-heartedness combined, these two things, I think I’m quite sure a lot of man-made problems can reduce if not eliminate, that’s quite sure. I think within this century I think world can be more compassionate century. For Religion & Ethics NewsWeekly, this is Kate Olson in Atlanta. Emory University students in “Secular Ethics 101” learn compassion meditation and discuss the possibility of an ethic that will unite the world.